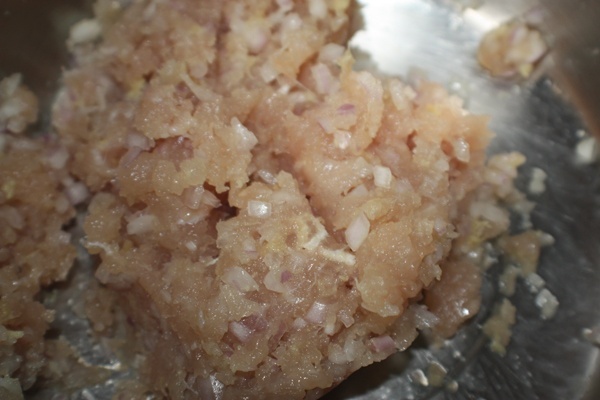 Combine the flour and salt in a bowl. Beat the eggs and mix with the water. Pour the egg-water mix into the flour, mix well and knead the dough till it becomes smooth and pliable. Let it rest for 10-15 mins. 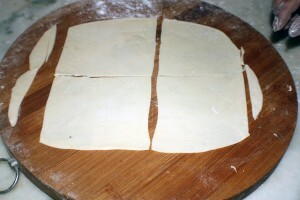 Divide the dough into 4-6 portions. Roll out the dough on a surface lightly coated with cornstarch (if you use flour it may toughen it up). Roll out as thin as you possibly can. Cut into squares. Lightly dust it with cornstarch and keep aside. Add the ingredients in a bowl and mix well. 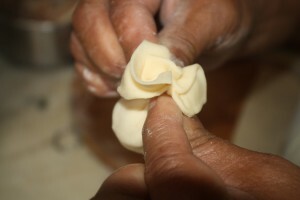 Take a square wonton wrapper Place a little filling in the center and scrunch it from all sides like a small bag. I find this method the easiest, but check out this link to see how you can fold wontons : How to fold wontons 8 different ways. Using the same method, prepare all the wontons. As an appetizer, you can serve them steamed or deep fried. 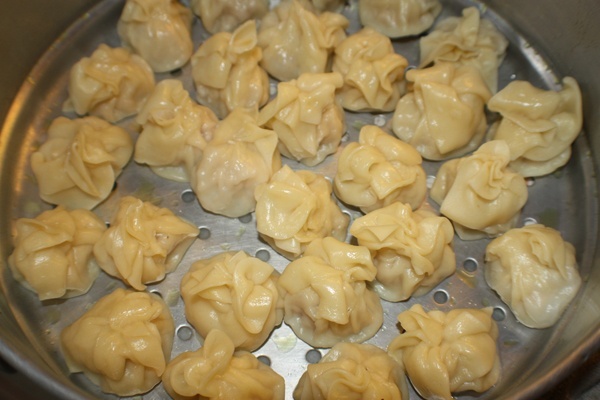 To Steam them, place the wontons in a steamer and steam for 15 mins. 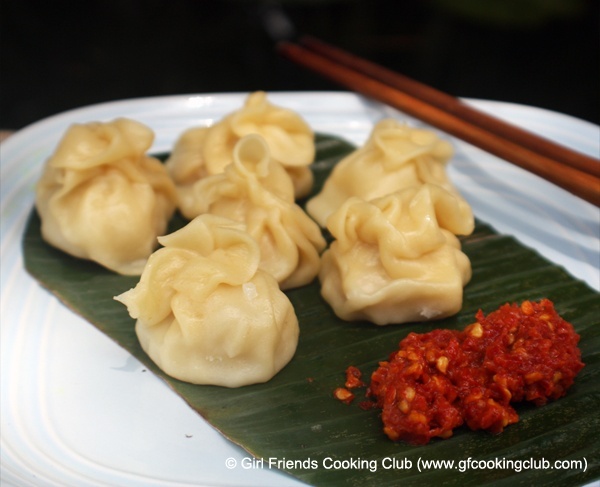 To deep fry them, heat a pan with about one cup of oil, and deep fry 6-7 wontons at a time. For the broth, put all ingredients in soup pot except for the Bak Choy/ Spinach leaves and scallion. Simmer for about 20 mins. 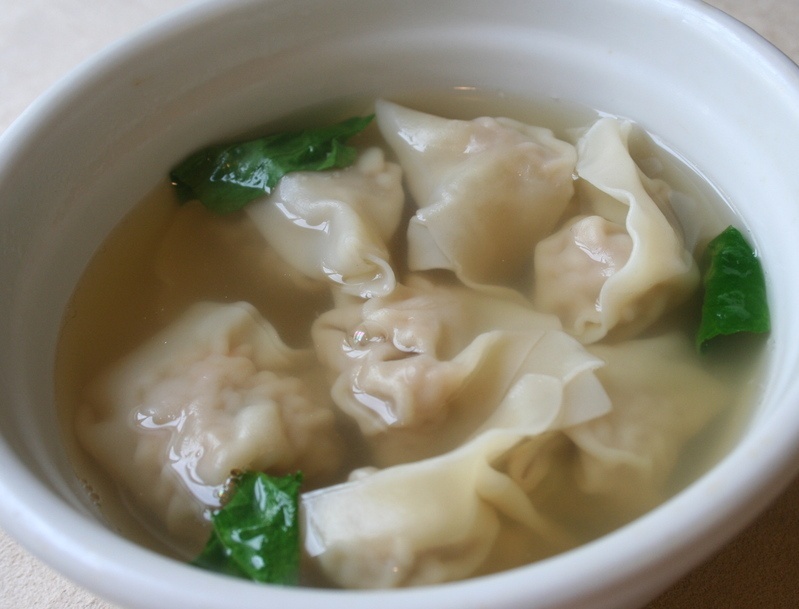 Once you’ve wrapped up your wontons, bring a pot of water to a boil. Drop wontons in. When they float to the surface drain them and set aside. To serve your soup, place some wontons in a bowl along with some blanched spinach/bak choy leaves and scallion. Ladle in the boiling broth and serve hot. 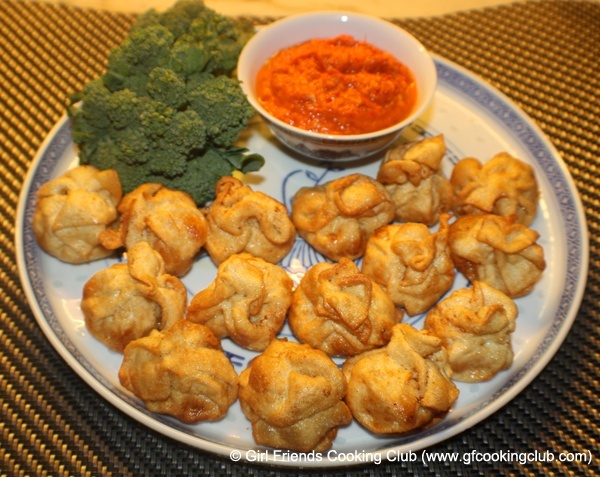 This entry was posted in Chicken, Pork, Snacks & Appetizers and tagged Wontons by Kamakshi. Bookmark the permalink.